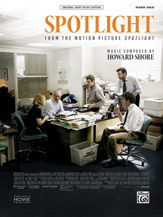 Boasting a star-studded cast and music by Academy Award®-winning composer Howard Shore, the 2015 film Spotlight tells the story of The Boston Globe's watershed 2002 investigation of the sexual abuse of minors by Catholic priests. Regarding the main title theme, Howard Shore commented, "The piano has such a black and white, ebony and ivory quality to it. It was the instrument that I felt could be this main voice for the film. There's a certain truthfulness to the sound as well." This original sheet music edition presents a piano solo arrangement of Shore's "Spotlight," the dramatic and evocative theme from the film.